Wilde in the Kitchen: Relayed for Life! This past weekend was the culmination of all of the fundraising and we had our local Relay for Life! Boyfriend and I got to participate and make many laps around the Relay track. I wasn't exactly sure what to expect, since I've never done a Relay event before, but it was lots of fun for everyone. I'm pretty sure that it was the kids that had the most fun at the event and who could blame them. It's a parentally okayed event that you get to stay up all night and run around in a field. Or that's how our Relay event turned out to be! The official events during the course of the evening were both fun and moving. I was intrigued to learn about the reasoning for an overnight event. 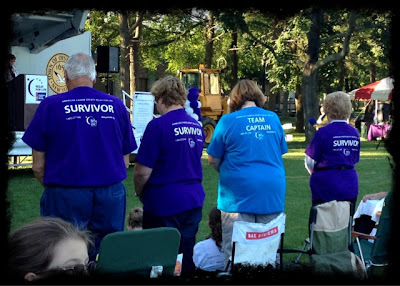 The event runs from 6pm to 6am and Relay is meant to mirror a persons fight against cancer. From diagnosis, to beginning treatment, to fighting through the darkness and finally being cancer-free, the setting sun begins the fight and the rising sun brings a new tomorrow with hope for a bright future. Unfortunately, not everyone who is diagnosed with cancer makes it through the fight. The memory of friends, family and strangers taken early by cancer are celebrated during the sunset luminary lighting. 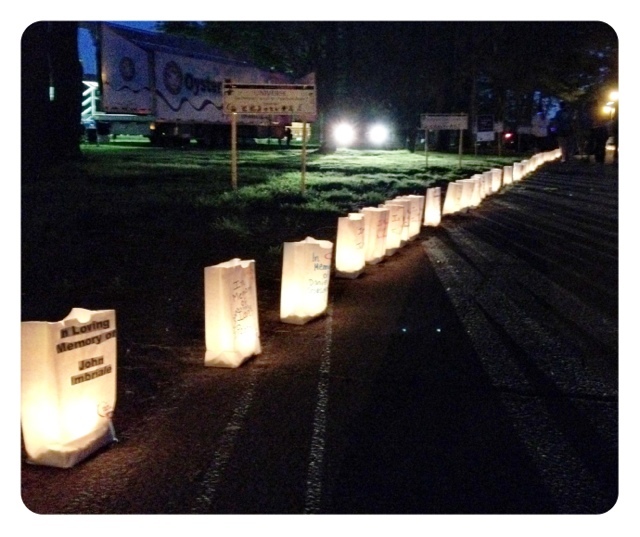 Probably the most moving part of the evening, luminary bags, decorated and dedicated, are lit with candles. These luminaries lined the track, giving the Relayers a guide through the dark, helping us continue through until sunrise. It was a fantastic event. 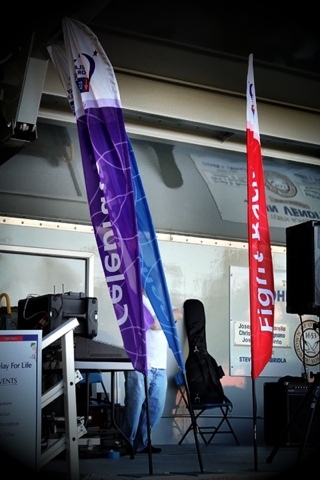 I would definitely recommend taking part in your local Relay for life event. I also wanted to thank you allot helping raise over $350 for our team in my online bake sale. That amount was actually matched by my company, bringing our total to just under $700! Thanks to everyone! To give you a little extra thank you, I made you a cheesecake. Made with freshly prepared, homemade ricotta cheese and locally grown strawberries! 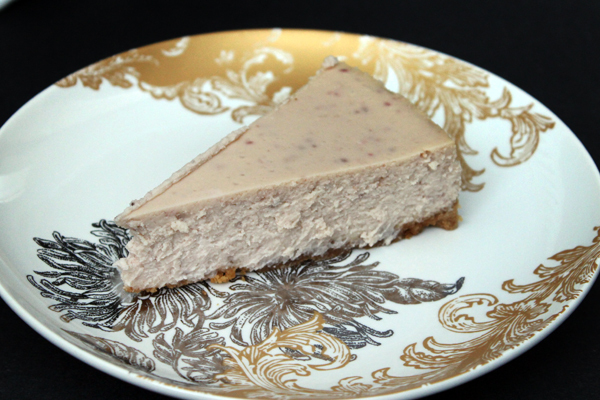 I used my homemade ricotta cheese in this cheesecake! If you want to make cheesecake, but don't have time to make ricotta, feel free to use store bought! Put two layers of cheesecloth in a strainer and place ricotta cheese in there. Let the cheese drain for 15 minutes before using it in the cheesecake recipe. Choose the most flavorful strawberries that you can find. I went to my local farmers market and got some "just picked last night" berries. I pureed them in my blender and used them as is. You can strain out the seeds if you want an extra smooth cheesecake. Heat oven to 350 F and grease a 9-inch spring form pan. To make the crust, mix together graham cracker crumbs and sugar. Add butter and mix until moistened. Pour graham cracker mixture into the pan and press into the bottom of the pan. Bake for 10 minutes. Remove from the oven and let cool while you prepare the filling. In a food processor or mixer, combine ricotta cheese and cream cheese. Mix until smooth. Add strawberry puree, sugar and vanilla and mix until combined. Add eggs, one at a time, waiting until each is incorporated before adding the next egg. Once the filling is smooth, pour into the prepared pan. Wrap the outside of the pan in aluminum foil and place in a roasting pan. 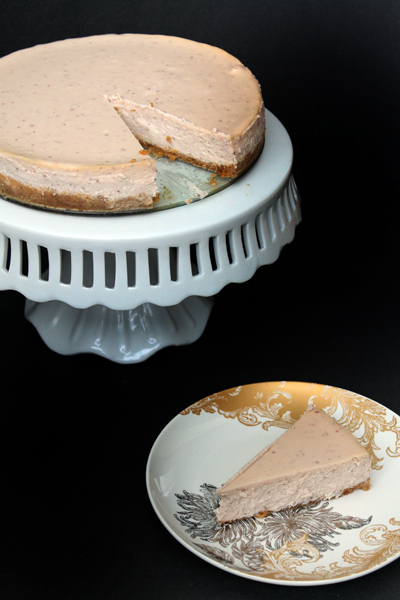 Fill the roasting pan with warm water until it is halfway up the side of the cheesecake pan. Carefully place in the oven and bake for 1 hour. When done, the center of the cheesecake will still wiggle when you open the oven. Remove cheesecake from the oven and place on a wire rack to cool (leave the cheesecake in the roasting pan while it cools). Let the cake cool for 1 hour in the roasting pan. Remove from the water bath and place the cake in the fridge. Let cake chill for at least 8 hours.